I SO miss Trader Joe’s Enchilada Sauce. I have tried a few other canned varieties but they taste like, well, can. I tried the powdered packets and found one brand that was almost passable, but I had to add tons of spices and I thought it still tasted too much like tomato sauce. Alas, I found great inspiration from Add a Pinch, and thus made very few changes but I now have a version that suits my palette. This is not too tomatoey and just the right kick. 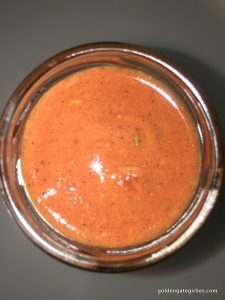 I use passata, which is uncooked strained tomatoes, but if you cannot find it, look for uncooked puree or worst case scenario pulse a can of plum tomatoes. Look at labels carefully as many tomato products are cooked with spices and/or oils. 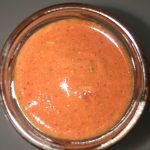 Passata is uncooked fresh unadulterated tomato puree. 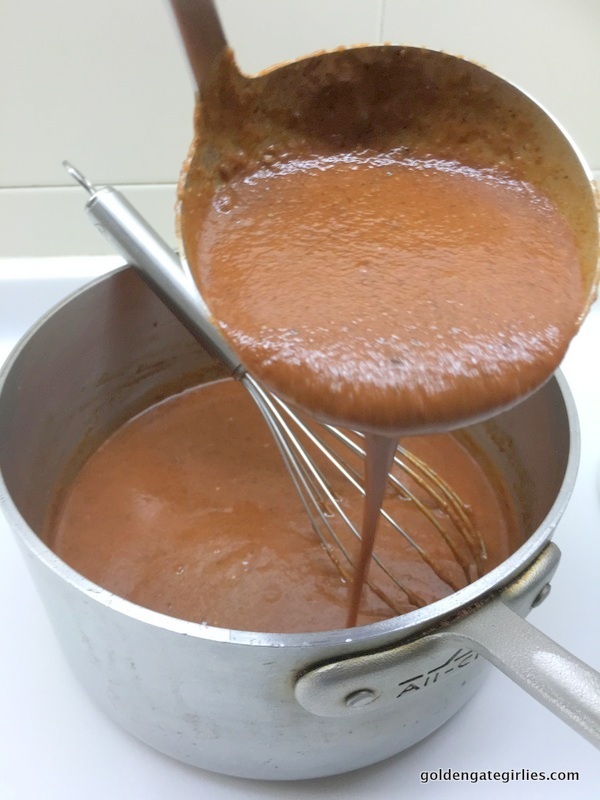 This sauce starts with a quick roux of vegetable oil and flour. Then, all remaining ingredients are added and sauce will come to quick boil then simmer for few minutes. If you like it thicker, keep cooking it longer. In a medium sized saucepan, add the vegetable oil and flour. Turn on medium heat and begin to whisk. Keep an eye on the color of the roux, it will start to darken and bubble. If it starts bubbling too fiercely, drop heat down to low and whisk until you no longer smell the flour. Add all remaining ingredients, whisk together on high heat until boils, then drop heat down to low and simmer for 2-3 minutes. Pour into jar and refrigerate. If becomes too thick, you can add water to thin.